When we came across L’ Eclair de Génie quite by accident after a day of sightseeing in Paris, it changed everything. The Mona Lisa, surrounded by iPads and clunky cameras had darkened my mood on what should have been a bright, cheerful experience of the Louvre on a Wednesday. I hadn’t cared for the hour or so of queueing, the pushing or sad six euro sandwich in the museum cafe. To placate my mood, Chris found us a pretty little bar down a side street, where a glass of red wine and a little bucket of popcorn brought my mood somewhat to life. And then, as we turned the corner to explore the area, we found the flagship store on Rue du Pavé and my eyes widened. The glass display was a row of colour, of fruit, chocolate and cream eclairs all perfectly lined up and waiting to be placed in a box. We chose four – a lemon meringue, a salted caramel, a maple and a chocolate and peanut that tasted like Snickers and I carried my precious cargo out of the shop with a delighted smile on my face. One that the Mona Lisa couldn’t elicit, but eclairs could. That experience sums up how I feel about food, the way its creativity brings me to life. If you’ve ever watched me watch The Great British Bake Off, my eyes in disbelief at the creations on the small screen, then you’d understand. Saturday marked five years of my wonder of food becoming a permanent slot on the internet, the day I decided, after walking around the BBC Good Food show in Glasgow in awe of the creations on display, that I should go home and just start writing. I felt inspired, so much so I wrote two blog posts over that weekend, my tools a Sony laptop that now feels so heavy its like lifting weights and a little Canon point and shoot which is now a bit battered. But those tools got me here, five years later still writing about the things that make my eyes widen like learning to whip egg whites a little slower to stop meringue collapsing or that chocolate can be manipulated to create a shine. It stirs something in me food, and what I love is that it can be serious but also playful and fun. 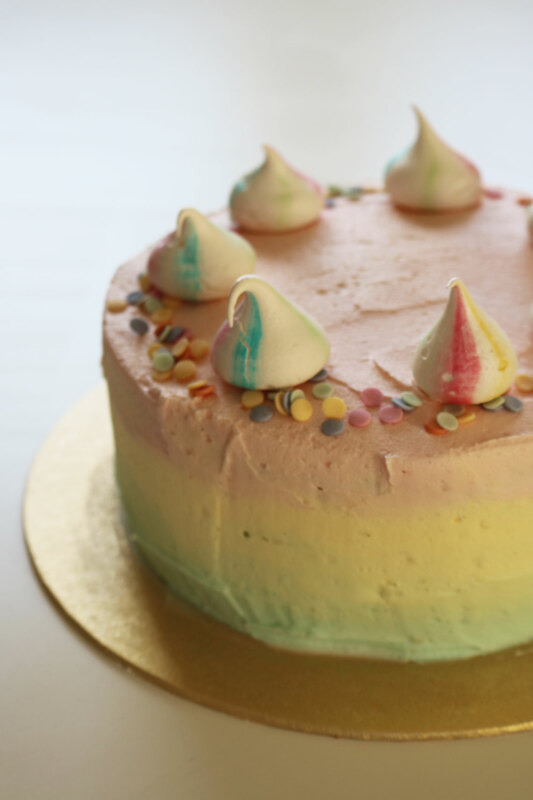 And so, here’s a sort-of blogging birthday cake in celebration of that, an outrageous burst of colour that makes me smile just thinking about it. In truth, this cake was created for a bake sale rather than my blogging birthday and my inspiration was something which would appeal to a child, although to me it is pretty much my ideal birthday cake. 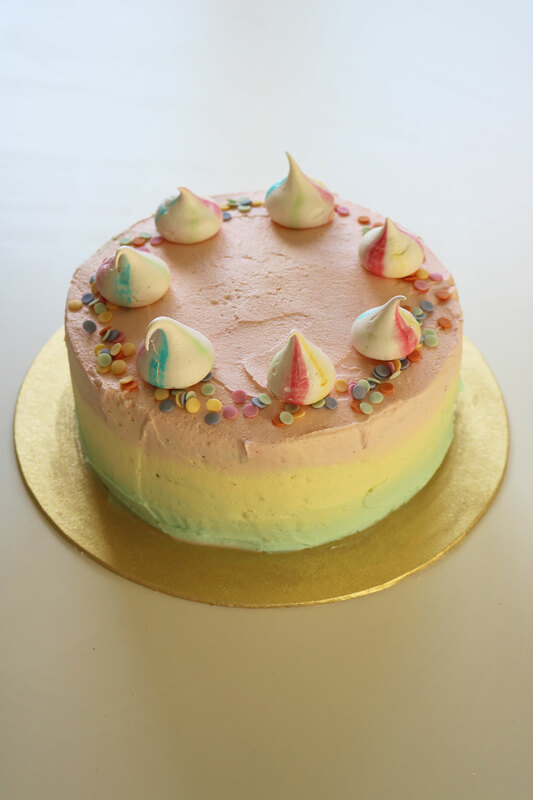 And so sprinkles were packed into a sponge, fluffy buttercream swirled together to create an ombre effect and rainbow meringue kisses and sprinkles adding even more colour to an outlandish cake. It is a rather sweet slice, but it’s fun and full of colour and reminds me of that feeling standing outside an eclair shop in Paris with a bag which felt like it was full of hidden treasure. I hope I never stop feeling this way. To make the cakes preheat the oven to 190oc/170oc fan and grease and line three 20cm sandwich tins with baking parchment. In the bowl of a stand mixer or in a large bowl if using a handheld mixer, beat together the butter and sugar for around three to five minutes until pale and fluffy. Scrape down the sides with a spatula to ensure its mixed well then start beating again on a medium high speed. Gradually pour in the egg, beating between each addition until smooth - it may split a little at this point but keep beating, it will come back together. Sift over the flour and baking powder and fold into the batter, adding a little milk if the mix feels too heavy. Fold in the sprinkles then divide the mix into the three tins and bake for around 18-20 minutes until golden and a skewer inserted in the middle comes out clean. Leave to cool for ten minutes before removing from the tins, peeling off the paper and cooling completely on a wire rack. To make the meringues, preheat the oven to 110oc/100oc fan. Weigh your egg whites and double the weight to give you the amount of sugar you will need. Place the egg whites in a sparkling clean stand mixer bowl free of any fats to allow the meringue to develop properly - wipe your bowl and whisk with a cut side of lemon and wipe down with a piece of kitchen towel to get it squeaky clean. You can use a handheld whisk and a large bowl if you like, just clean your equipment the same way. On a medium to low speed, begin to whip up the egg whites - don’t be tempted to whip too quickly or your meringue could collapse. You want to slowly whip until the mixture froths and turns to a thick foam - if you can upturn the bowl over your head and no egg whites fall out, you’re good to go. Turn the speed up to medium high and add the sugar tablespoon by tablespoon to the beating mixer. Once the mix has been whipping for roughly five minutes and is glossy, turn off the mixer and rub the meringue between your fingers - if you can feel sugar granules, keep whisking for a further two to three minutes until the mix feels smoother. Add the vanilla, whisk again then set the meringue aside. Place a round nozzle in a disposable piping bag and cut off the tip so that the nozzle sits flush with the opening of the piping bag and turn the top inside out to help it stand up. Using a clean paintbrush, paint lines down the length of the bag in each colour, taking care not to let the bag fall in on itself, turning the bag as you go for each colour. Carefully spoon in the meringue and gently shake the bag so that the meringue falls to the bottom without disturbing the lines. Line two baking sheets with baking parchment and pipe a small piece of meringue in each corner to stick the paper down. 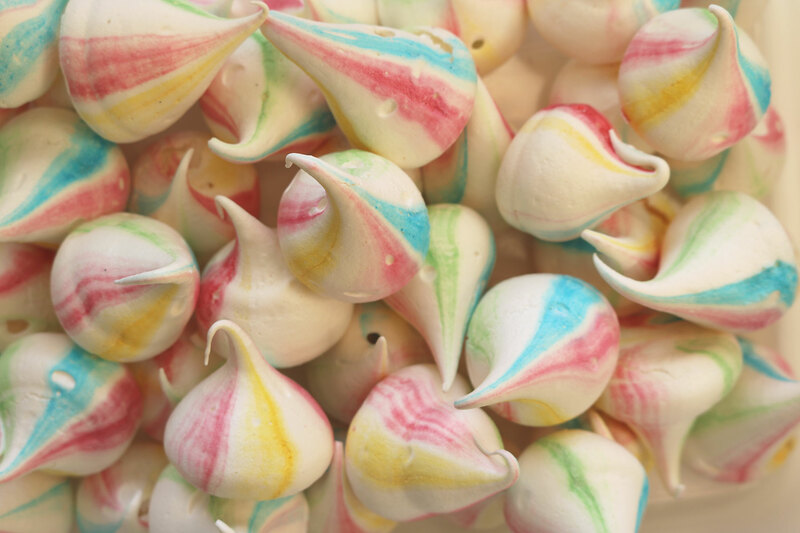 Squeeze a little meringue back into your bowl until the colourful lines appear like toothpaste, then hold the bag vertically about 1cm from the paper and pipe down, releasing the pressure and pulling up to create the little tail for each meringue kiss. Repeat with all the mixture, spacing each one about 1cm apart. Once all the meringue is used up, bake for 30-35 minutes until each kiss can be easily removed from the paper when you lift it up. Leave to cool and store in an airtight box for up to a week. 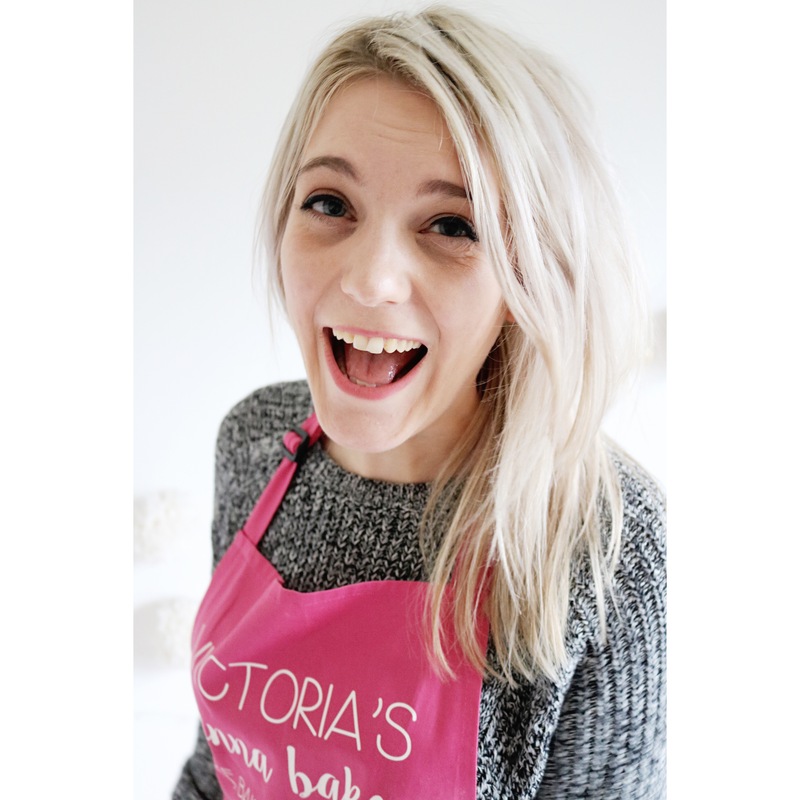 This recipe makes more kisses than you will need for the cake, so use in eton mess, on top of cupcakes or simply enjoy. To make the buttercream, beat the butter in the bowl of stand mixer or large bowl if using a handheld mixer for around two to three minutes until whipped, pale and creamy. Add half of the icing sugar and slowly combine together to stop the sugar puffing out of the bowl, then beat on high for around a minute until fluffy and smooth. Add the remaining icing sugar and repeat, increasingly the speed and beating until the buttercream is pale and fluffy. Add the vanilla and a splash or two of milk to loosen the mixture and beat again to incorporate. Don’t overmix as the butter could warm up too much and the buttercream collapse. To assemble, smear a little buttercream on a cake board and place one of the funfetti cakes on top. Spread around two tablespoons of the buttercream across the top of the cake up to the edges then add a layer of raspberry jam. Repeat with the second cake and top with the third. Crumb coat the cake to a smooth finish and to lock in any stray crumbs then refrigerate for 10 to 20 minutes while you prepare the coloured icing. Divide the remaining buttercream into four bowls, placing slightly more buttercream in the bowl that will house the pink icing as it will cover the biggest surface area. Colour each one with the gel colourings to a pastel blue, green, yellow and pink. Remove the cake from the fridge and using a palette knife, roughly smear the blue icing around the bottom of the cake. Once it is in a fairly even layer around the circumference of the cake, repeat the step with the green icing, placing it just above the blue, then the yellow on top of the green. Finally dollop the pink icing on top of the cake, smoothing across the top and bringing down the sides to meet the yellow icing. Don’t worry if it looks a little messy at this stage, it will all be smoothed out. Clean the knife and hold at a 45 degree angle vertical to the cake and turn the cake slowly to meld the colours together. This is easiest on a revolving cake stand but a normal one will work just as well, you’ll just need a little elbow grease to turn the stand and hold the knife still at the same time. Repeat a couple of times if necessary then starting at the edge, drag the knife into middle of the cake to smooth it off, turning as you go until it is level. 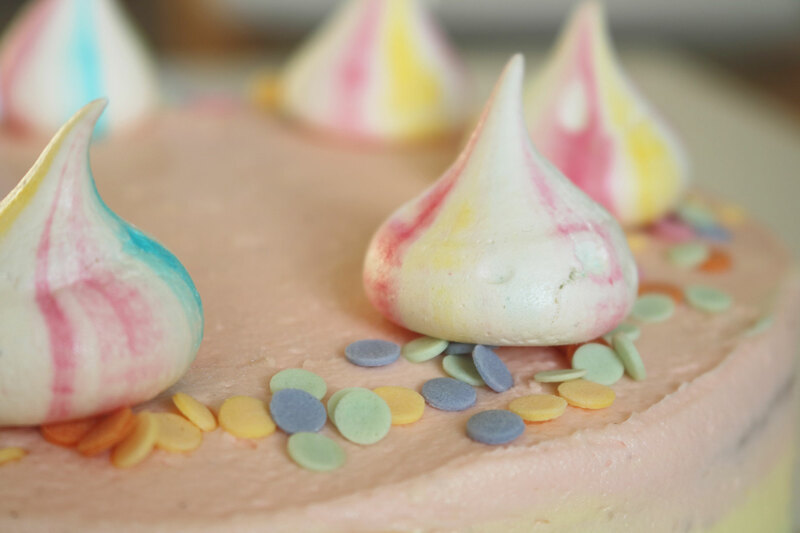 Stick the meringue kisses onto the cake using a little buttercream and add the round sprinkles around the edge of the cake. Alternatively, pile the meringues in the middle. The cake should keep in an airtight container for a couple of days minus the meringues which you should add when you are ready to serve. This cake is too cute! I definitely need to make it. I’m saving this recipe for later! Thanks Cassie, it’s a really fun one to make! I had one of those just yesterday. Have to say… yumi!! Thanks Jess that’s really sweet! This looks incredible! What sprinkles did you use and where did you get them from? Thanks Aleeha! They’re called rainbow confetti and I bought them at Tesco. 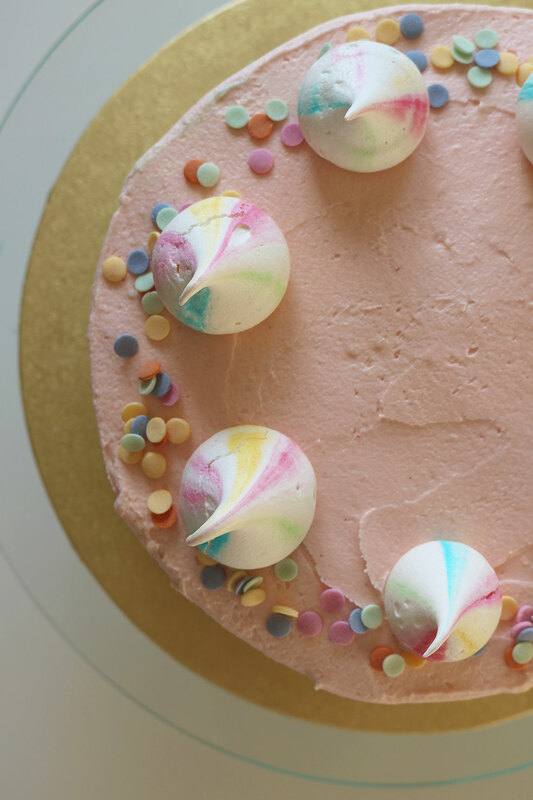 For the funfetti sprinkles inside the cake I would suggest looking at a cake or craft store for really pigmented rainbow sprinkles so you don’t loose the colour when baked – think you can order really bright sprinkles from Amazon too!